Since we've gotten into the pirate line, we (I) decided we needed suitable bases of operation. Pirate-friendly islands were necessary. I found some reasonably complete items on eBay and got them today. I'm really impressed by the scale and thoroughness of these sets. They're nicely sized sets of the sort that sadly don't seem to be offered any more. Next up is to find a largish piece of blue carpet remnant to serve as the Caribbean. I took advantage of the latest Buy Two Get One at ToysRUs to add the 4294 lighthouse (hasn't arrived yet) so we'll see how that stacks up, but the plan is to have an English corner, a Spanish corner, and a couple of bases for our lovable scoundrels to go privateering from. 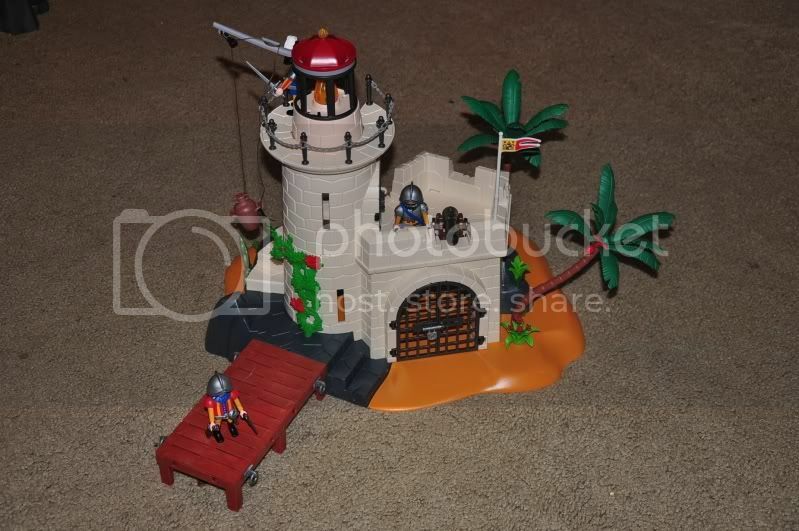 Given the popularity of the pirate sets, it seems strange that Playmobil wouldn't currently offer any islands larger than the little compact sets. That base is really cool. And then put the bases on their countries! welcome to the pirate world racerx. it will be difficult to leave it. congratulations on you new sets. it would be so easy to have new islands but geobra just seems to forget their own "construction" strategies. in the african wildlife theme they made up a lot of "little" sets that could be added to one another creating a larger landscape. it would be so easy to do the same with a pirate island - dividing it in several smaller (and sellable) sets that would fit eachother using the system-x capabilities. 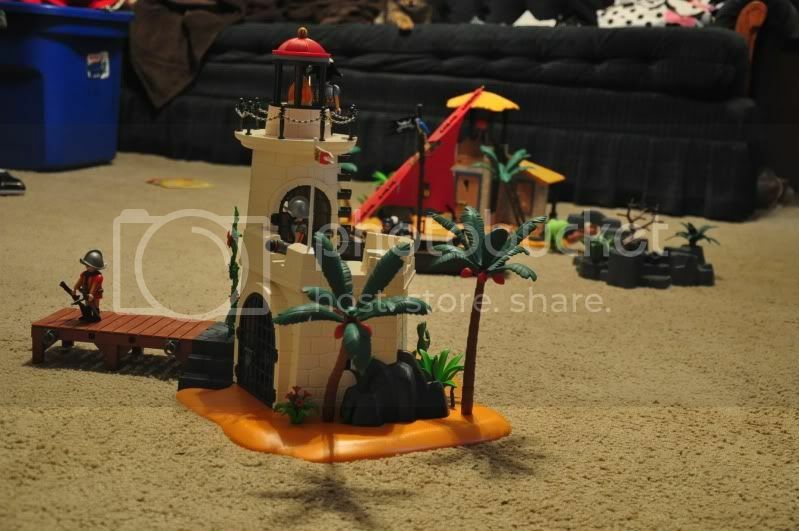 ... the only improvement i can imagine would be some "finish" pieces that could be taken out when you decide to "glue" the various sets (this pieces would come out and be "stored" outside the growing island). ... and a "long" island wouldn't be that odd - i am one of the proud few humans who have landed in the formigas islets (in the middle of the atlantic in the axores archipelago) and they can look very "piratical". That's great, 3799 is one of my all time favorite sets. Lots of play value there. 3799 is my all times favourite!!! So much fun and so many creative hours of play with it!!! Can you really wait that long to play with it? Great sets, well done on aquiring them. 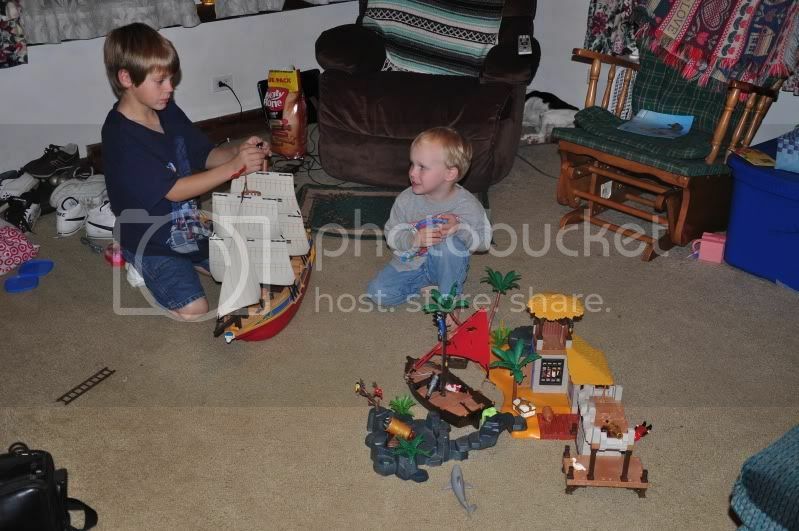 You have acquired several of the best Pirate sets that Playmobil has produced! Welcome to searching for the rest of them on eBay ! Okay, I take back everything I said about Playmo's current island offerings. The 4294 is pure redemption in a box, and goes a long way toward making up for for all their little mini-island sets. 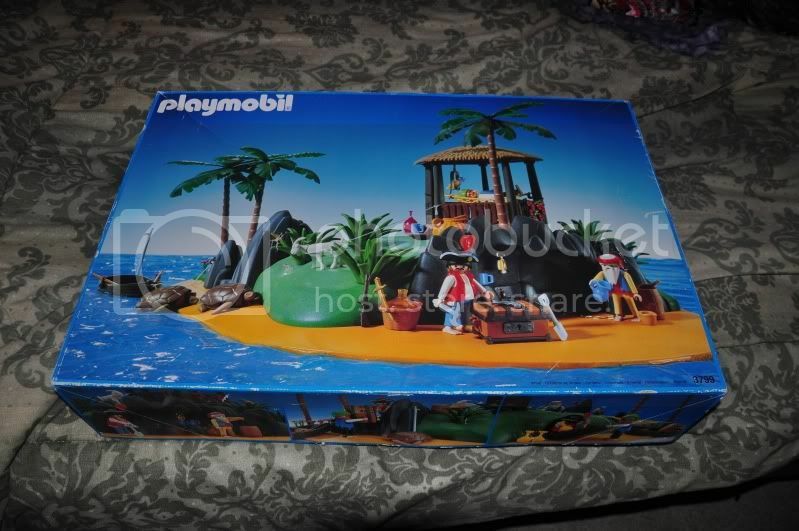 Granted, I'm fairly new to the Playmobil universe, but I don't think I'll ever get used to the loose packaging of their sets. It seems to work okay, but it really seems like a sure way to guarantee breakage. 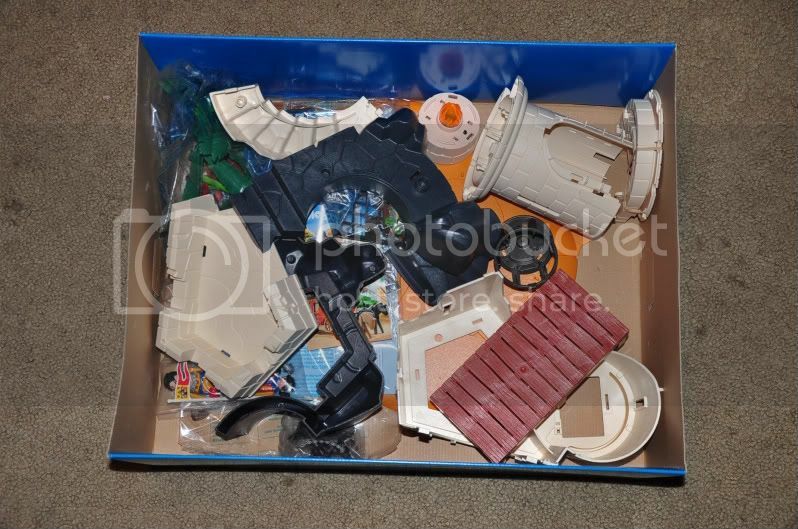 Other than that, assembly was typically PM straightforward, with good quality plastics. System-X connections are limited to the dock, with everything else snapping into place. I understand a lot of people look for the expandability of the Steck and System-X systems, but as a stand-alone fort/lighthouse, this works great. The completed set looks fantastic, is very sturdy, and attracted my twins right away like moths to a flame. 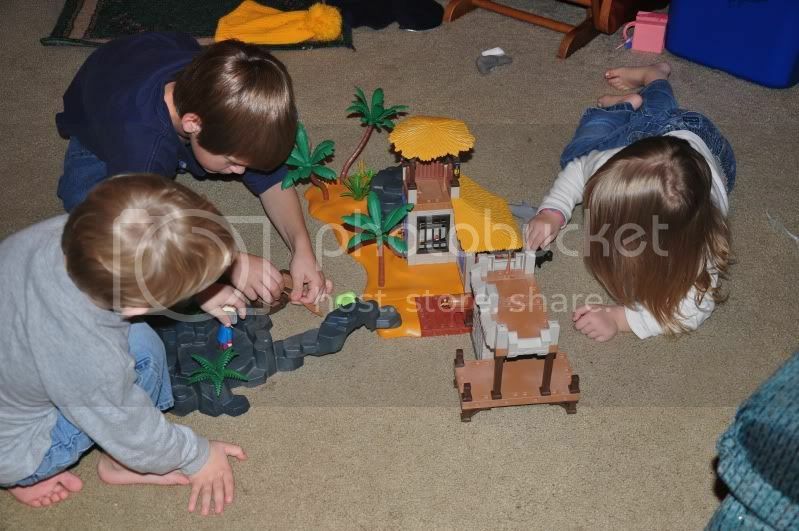 They also thought it was cool that it was the same fort that they saw at the end of the Playmobil Pirates game for the Nintendo DS. Needless to say, before bedtime many cannon attacks were rebuffed, numerous pirates were jailed, and countless ships saved from dangerous shoals by the beacon. This set renewed my faith in the current and future PM pirate lineups, and leads me to believe I didn't necessarily miss all the good stuff. O my gosh!!! 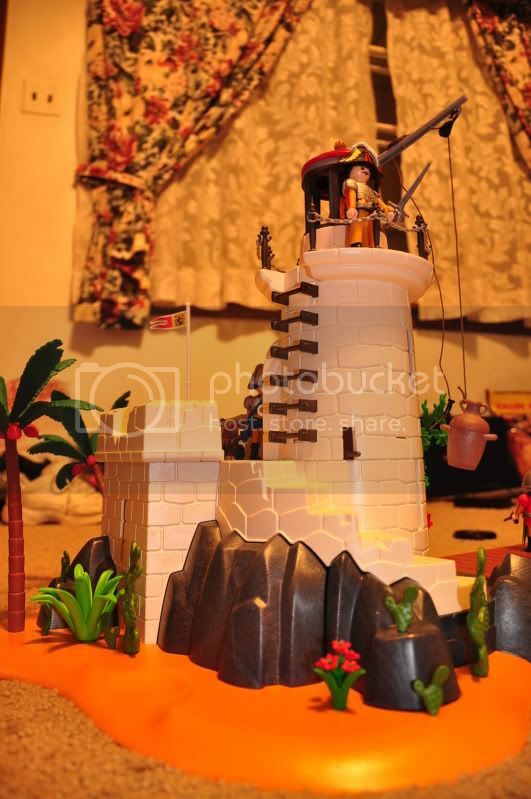 Looking at the pictures on the carpet, with the lighthouse in one side and the lagoon on the other and the 4444 ship in the middle I wish I was a child today!!!!! More time to play!!! The beacon is soo much fun to play with!